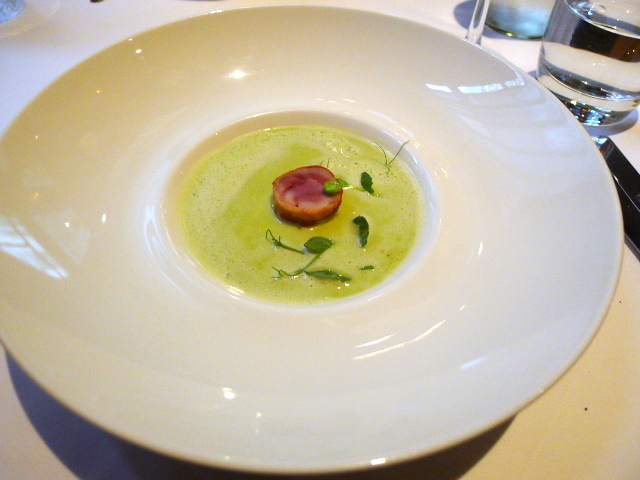 A pea velouté boasted of a nice pea flavour even if it was a little runny. It was served with some roasted quail which was gamey and supremely tender. It had been wrapped in bacon which heightened its flavour and helped to keep it moist. Sautéed monkfish was well cooked and accompanied by a piece of Old Spot pork belly that had been glazed with a delicious mixture of honey and soy. The pork was tremendous and worked wonderfully with the monkfish. 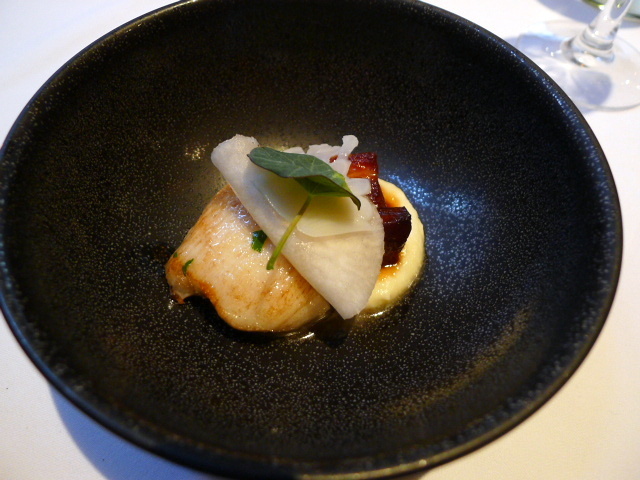 Other nice touches in the dish included some pickled turnips that added acidity and a creamy cauliflower purée. This was followed by another fish course of Wild Brixham sea bass. 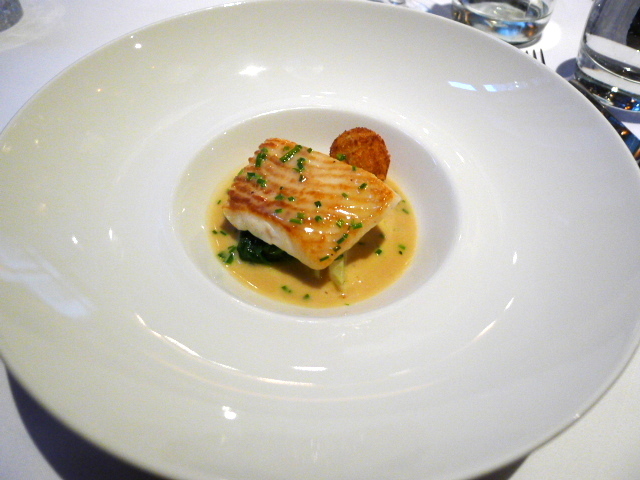 The fish was delicious with a crispy skin and paired with an excellent Pernod velouté that dressed the fish well. Delicately cooked pieces of finely sliced fennel sat as the base of the dish and were scrumptious. 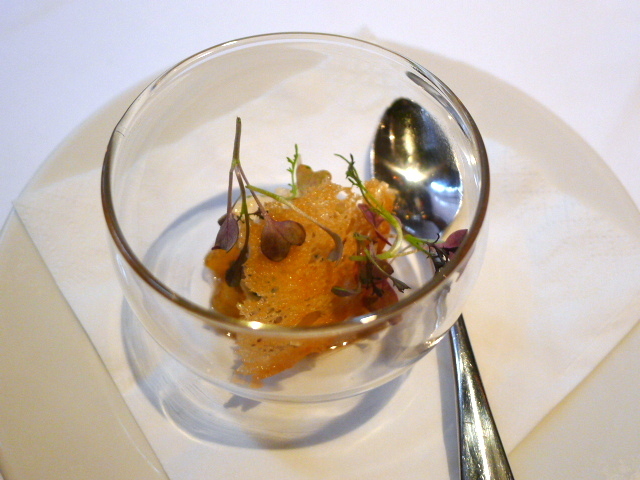 The meat course was a pan-fried duck breast served with a confit leg and foie gras. The duck was nicely pink however it was ever so slightly chewy. 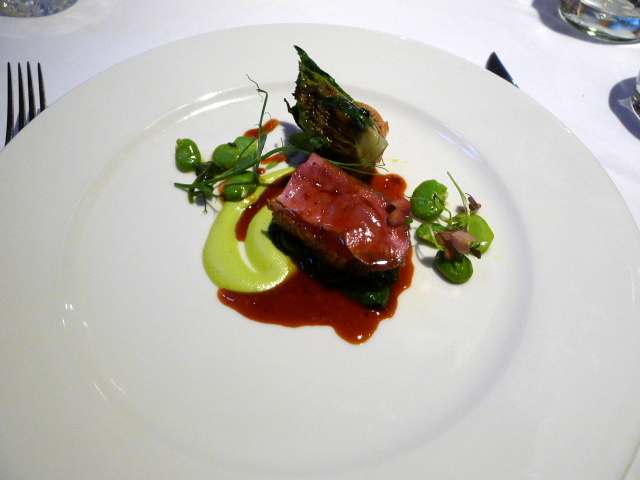 The seared foie gras was wonderfully rich and unctuous, and completing the dish were some broad beans which had a lovely bite to them. We also ordered a side of hand cut chips (£4.50) which were excellent – crispy on the outside and soft on the inside. 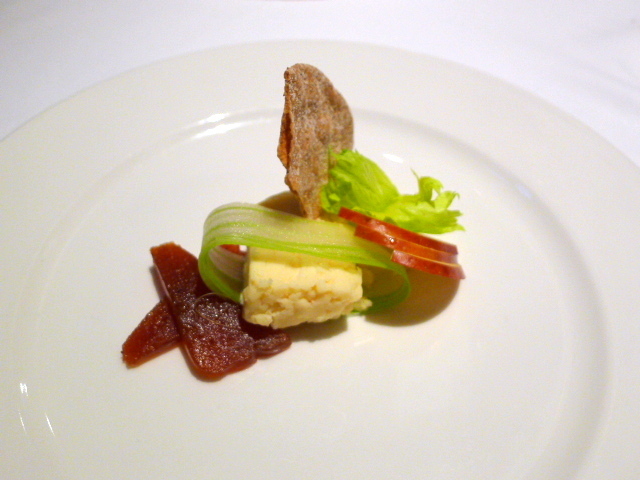 A cheese course followed – Little Black Bomber from Denbighshire in North Wales. A 2010 Silver Medal winnder at the Nantwich International Cheese Show, the cheese was pleasant on the palate with its mature flavour. 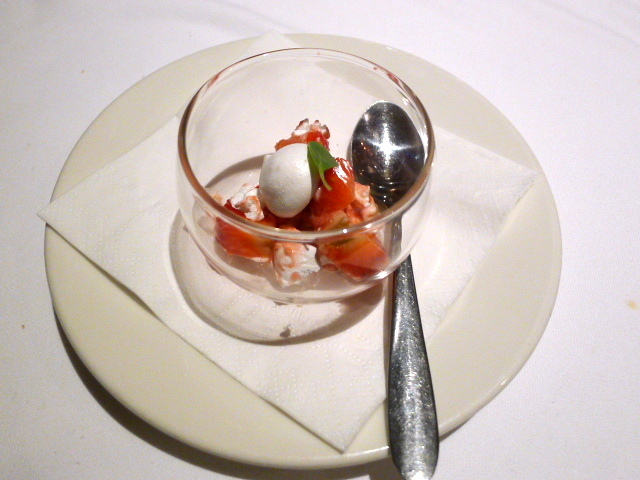 The pre-dessert was a yummy miniature serving of strawberries and meringue, with a Banana soufflé and peanut butter ice cream being the dessert of the day. 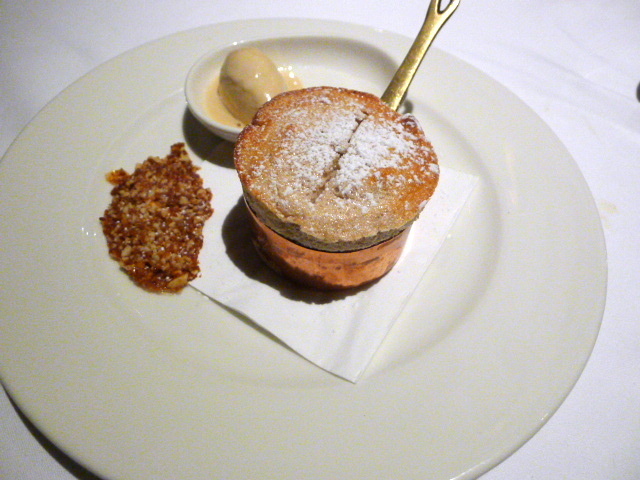 The soufflé was airy and light and not too sweet, and the combination of the peanut butter with the banana was a pleasant choice but probably not quite zingy enough or rich enough to be interesting. The better dessert was the incredibly rich and decadent chocolate delice with a crème fraîche sorbet from the a la carte menu. We substituted this for one portion of the soufflé and it turned out to be a wise choice as we were rewarded with a skillfully prepared concoction of chocolately goodness. 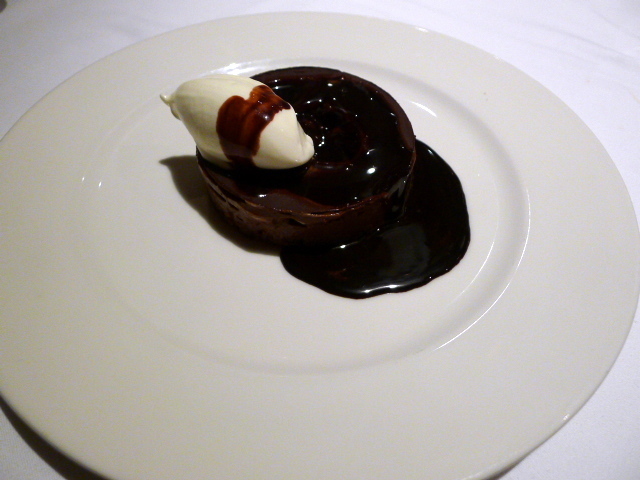 Hot chocolate sauce was poured over the delice at the table which created a melting effect. The White Swan offered some great food for a gastropub. All the dishes were smartly done and well executed and it was difficult to find fault with any of the cooking in a menu that showed great flourish. The service was reasonable although at times we found the food a little slow to arrive. That said, The White Swan is a place I would go back to again because it was worth it.